The SDS Group is one of the country’s leading scanning bureaus. At our offices we can scan and archive a complete range of paper documents. Our comprehensive range of equipment ensures that regardless of whether we are dealing with 100,000 pages of personnel records or the most fragile document, the largest plan, or longest photo, all can be scanned safely and efficiently. Every item is individually handled by our staff. Below are just some of the equipment we have in our bureau. With precious or fragile books it is often necessary to use a planetary scanner to safeguard the spine of the book. Ourspecialist overhead or planetary book scanners can be used to scan all kinds of books, and can facilitate many different sizes, thicknesses and types of bindings. It is especially easy on battered old volumes, or rare and priceless books. 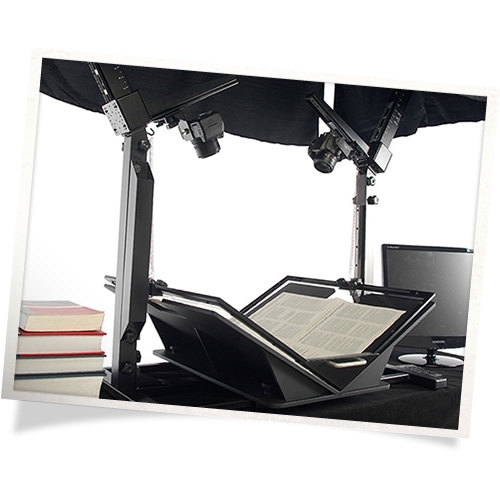 These scanners feature a unique v-shaped book cradle and transparent plate to help protect bindings. Scanning is performed without laying out books flat and applying undesirable or unnecessary force to their bindings. Plans up to A0 size can be scanned, as well as documents up toten metres in length. A single CD-ROM can store up to approximately 30,000 sheets of scanned A4 paper documents, or upto 3,000 large format A0 drawings.